Sponsored by Hawa Group Americas Inc. It turns out that the motion of an opening door makes a lot of difference. Whether wood, metal, or glass, opening doors by sliding them along an existing wall or into an existing pocket instead of swinging them open saves a lot of space. Sliding doors require a fraction of the functional footprint required by a hinged door, and this can generate real cost savings as well. Sliding doors are a more space-effective solution than swinging doors for providing a barrier at a room entrance. The traditional hinge-and-pivot door requires a clear operational footprint that is large enough to accommodate the swing of the door as it moves from open to close. The average size of an interior commercial door in the United States is 36 inches wide by 84 inches tall. In a typical application, where the average-sized door makes a full 180-degree swing, more than 14 square feet (2,016 square inches) must remain clear and unobstructed for the door to work properly. Proper operation of a sliding door requires much less clear space, and that space often falls either along a wall or inside a wall, if the sliding door is recessed. If the average sliding door is 36 inches wide by 84 inches tall by 1.75 inches thick, it requires a space only that size be extended along the track. Consider the layout of an average 10 foot by 15 foot private office with a pivot door. The first 3 feet of the office space are used, almost exclusively, to allow the door to open and shut, leaving a 10 foot by 12 foot space to fill with office furniture and dedicate to office work. If the pivot door is replaced with a sliding door, the exact same office furniture and functionality can be provided in an office that is actually 10 feet by 12 feet. Designers can provide clients with essentially the same office in a space that is 20 percent smaller. Sliding doors are a more space-effective solution than swinging doors because they require that less space be kept clear and unobstructed for the door to work properly. Space is one of the most valuable assets in the built environment. Eliminating a swinging door from the floorplan can return a lot of square footage back into active duty and enable designers to do more with a smaller amount of space. This flexibility offers a real value. LoopNet™, a website that tracks commercial real estate trends in Chicago, identifies the current median price for office space as $139 per square foot. At that price, the 20 percent smaller office footprint enables a designer to save $4,170 per office. Sliding doors also save space because the ADA requires a smaller clearance for maneuvering in front of a sliding door when compared with the clearance required in front of a swinging door. Section 404.2.4 of the ADAAG defines the acceptable maneuvering clearances for different types of doors. Clearances for swinging doors and gates are defined in terms of the approach, whether it is parallel or perpendicular to the door, and whether a person is maneuvering around the pull or push side of the door. The maneuvering clearances required by the ADA in front of sliding doors is nearly the same as the maneuvering clearance required when there is no door on an opening. Incorporating soft, glare-free daylight and outdoor views into the built environment has been proven to have a powerful effect on the people and energy use in the space. When people have access to daylight and outdoor views from inside a building, studies have shown an increase in productivity and an improvement in mood. They also learn and heal faster. With regard to systems efficiency, dimming electric lights or turning them off when sufficient daylight is available has been credited with reducing the energy used by the lighting system by 20 to 80 percent. The potential upsides to occupant well-being and energy efficiency have motivated many designers and building owners to demand more daylight and access to views deeper into the floorplate. 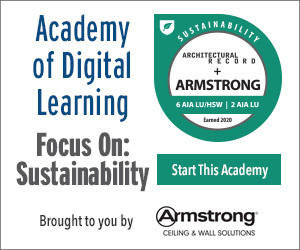 Even the latest version of the green building rating system, Leadership in Energy and Environmental Design (LEED™) v4 awards points for achieving a certain degree of daylight penetration and view in most of the regularly occupied spaces in a building. Daylight penetration in the interior is affected by many design decisions. Fenestration choices on the building envelope, such as the window-to-wall ratio, building orientation, type of glass, and the daylight control mechanism, all affect the amount of daylight allowed to pass into the interior space. Interior design decisions about the layout of the floorplan, furnishings, and finishes determine how deeply daylight is allowed to travel once inside. In an effort to bring daylight deeper into the space and provide exposure and views to a greater number of building occupants, designers are trading in those perimeter private offices with walkways and communal areas. Interior palettes that used to boast dark and rich colors have been replaced with lighter neutrals that do a better job of reflecting daylight, instead of absorbing it. Space partitions are being lowered, and solid doors and walls that stop daylight in its tracks, and obstruct views, are turning into glass and sliding out of the way when not needed, minimizing the obstacles that prevent daylight from traveling deeper into the interior and block line-of-sight to the outdoor environment. The headquarters of Fortis Commercial Construction in Dallas, Texas, is a 3,000-square-foot office in a high-rise with floor-to-ceiling windows on south and east-facing exposures that offer views of both tree-filled residential areas and the bustling Dallas cityscape, which includes the Winspear Opera House, the Federal Reserve building, and the giant Ferris wheel at the Dallas fairgrounds. Sliding glass door systems are used as the doors for the perimeter private offices and the perimeter conference room. The glass sliding system was selected because it satisfied two of the primary objectives of the space: make the most out of every square foot, without chopping up the floorplan and making the space feel small, and maximize the access to the great Dallas view available throughout the space. 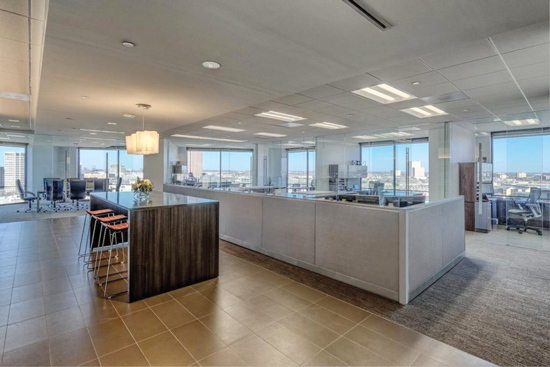 At Fortis Commercial Construction in Dallas, sliding glass doors enable daylight and views to penetrate deep into the interior space. “Using sliding glass panels kept the entire space feeling open and bright, and lets everyone enjoy the views from almost every corner of the space,” explains Sharon Vaughan, principal. Using glass panels in sliding door and wall systems enables daylight to travel deeper into the interior spaces. 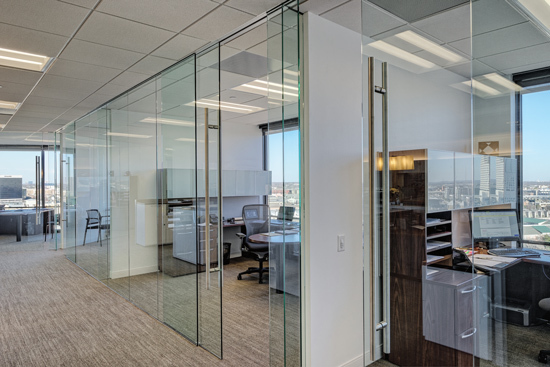 There are certain glass-specific considerations that must be made to select a glass sliding hardware system that is safe for the project space and able to satisfy the aesthetic preferences of the design team. If glass is selected as the panel material for a sliding hardware system, the designer or design team will need to choose between installing a machined glass panel or a non-machined glass panel. There are essentially two ways to mount a glass panel into an architectural sliding system. One is to drill holes or cutouts into the glass—a process called machining, which enables the mounting mechanism to be inserted through the glass panel and attached to the system. 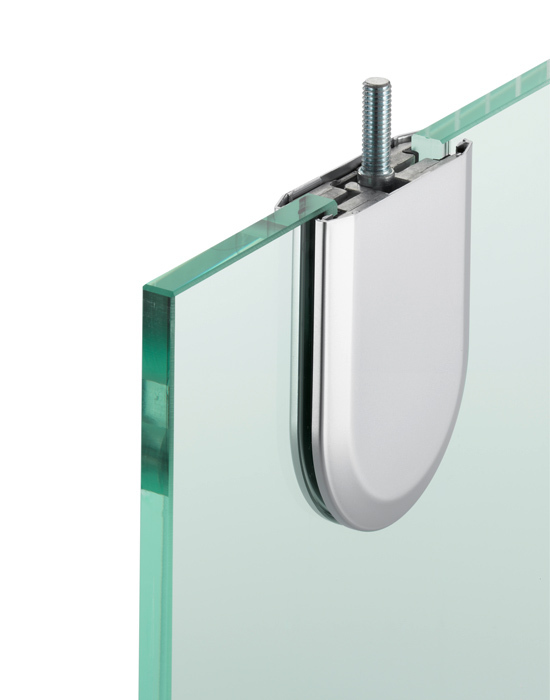 The other way to affix the glass panel to a sliding system is to select a clamp-style mounting, where the mounting hardware clamps onto the glass, holding it in place. While the clamp will mount a glass panel that has not been machined, or non-machined glass, there is a risk of the glass slipping in the clamp, as the prolonged movement of the system combined with the weight of the panel can cause the glass panel to shift and vibrate. With machined glass, the mounting hardware does not physically clamp onto the glass, but instead attaches through the glass, via the cutouts that have been machined into the glass panel. When specifying a glass panel for a door or wall system, transparency is often an aesthetic objective of the design team. The type of mounting will impact whether or not the mounting hardware is fully concealed or visible and to what degree. There are five mounting options for glass panels. In a frameless mounting, the hardware is fully concealed in the track, preserving the transparency provided by the glass system. This mounting style may require that the glass panel be machined and can be used with either fully tempered or laminated glass. The patch fitting mounting style requires machined glass and provides minimal hardware exposure. This mounting option is often the most economical and can be applied to both fully tempered and laminated glass. A patch fitting is one of five mounting options for sliding glass panels. In a suspension profile mounting, the suspension hardware is concealed in the cover profile, essentially hidden from view. The mounting style may require machined glass and can be used with either fully tempered or laminated glass, although some restrictions apply. The framed mounting style frames the glass panel on all four sides and provides rigidity for tall glass panel applications. This style does not require machined glass. A friction clamp mounts glass panels without requiring that they undergo the machining process. This mounting option may not be suitable for panels that weigh more than 220 pounds and is often not recommended for use with laminated glass. Sliding door and wall systems are tools that enable designers to create space layouts that were not possible with hinged door solutions. They deliver unparalleled flexibility in multipurpose spaces, and offer a unique opportunity to camouflage and conceal spaces or equipment when they need to be temporarily out of sight. As an alternative to the standard pivot door and stationary wall, these systems also enhance the experience in a space by giving owners and occupants something unexpected. Designers will experience a new degree of design freedom as they unhinge their spaces and creative visions. The ICC International Building Code® (IBC) caps the width of a swinging door that can be used in a means of egress at 48 inches. For this reason, and some other limitations on available material sizes, most door manufacturers commonly produce swinging doors only up to 48 inches wide as part of their standard product offering. This generally limits the width of most hinged openings to 48 inches for one door or 96 inches (8 feet) for two doors, without subdividing the space with the physical obstructions of additional door frames. As sliding systems require no door jambs, designers can create wider openings with commonly available door widths by using multiple sliding panels. Sliding doors and wall systems are an innovative solution that can enable designers to maximize the flexibility and adaptability built into a space. An open office space can be transformed to accommodate a visiting guest or provide a temporary conference room for a group discussion by simply sliding a wall system into place. Restaurants can keep the floorplan open to seat as many general diners as possible and then enclose a section to provide a more private group dining experience, when booked. Moveable wall systems easily subdivide a large hospitality space into smaller, more intimate areas with a customized aesthetic and then smoothly slide out of the way to accommodate a bigger event. Designers are also integrating sliding wall systems into residential spaces in large urban cities where space is at a premium. A sliding wall can temporarily partition off the bedroom or create a more formal dining room when entertaining in these spaces. Beyond using a sliding door or wall to subdivide a larger space into smaller, functional areas, these systems can also conceal areas or equipment from the visual space. A good fit for both commercial and residential applications, these systems can hide away kitchenettes or laundry areas when not in use.